For over 50 years the finest Apple Cider Vinegar has been produced and used by horse owners as a natural addition to the diet. 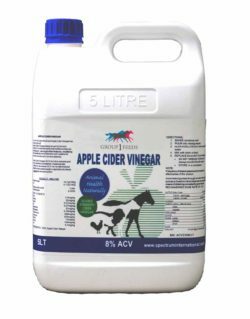 Apple Cider Vinegar taken as part of a holistic approach to animal health and welfare enhances wellbeing by modifying the intestinal environment to a pH suitable for beneficial bacteria to function optimally. This change in pH has been found to be beneficial in the prevention of intestinal stones called enteroliths.